Jamail Johnson’s mother Shirlene Hill visits his gravesite at Tod Homestead Cemetery, located on Belmont Avenue, on Saturday afternoon. She visits his grave every day. Photo by Kacy Standohar/The Jambar. Shirlene Hill recieved an unexpected but welcome visit from Jamail Johnson’s fraternity brother Steve Lemley on Thursday evening at her home on Shannon Road in Girard. Photo by Kacy Standohar/The Jambar. 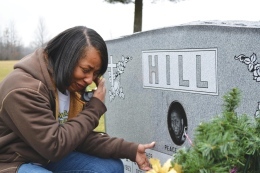 Every day since her son’s death, Shirlene Hill drives past Jamail Johnson’s grave on her way to work. She greets him in the morning and says goodnight to him as she drives home. Hill lost her son a year ago, but the brothers of Omega Psi Phi have tried to fill the gap since. 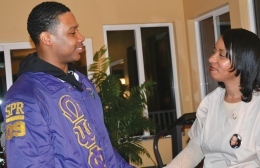 A year after the off-campus shooting, Johnson’s mother has not lost sight of what Omega Psi Phi represents. “The brotherhood, the togetherness, the love. These young men that he crossed over with, they haven’t missed a beat,” Hill said. Hill added that the brothers have been there every step of the way. She expressed her gratitude for all of the kind gestures she received from the young men. Hill was once skeptical of the stereotype associated with fraternities, but her son’s dedication changed her perspective. Hill said she has nothing but positive things to say about Omega Psi Phi and the rest of YSU Greek life. She said the fraternity completed Johnson, and he was proud to be a part of it. The brothers of the Zeta Gamma chapter recently gave money toward Johnson’s Youngstown State University scholarship. Hill and her husband, Sidney, agreed that the brothers can stop by anytime. “I’ve always been that mother that, no matter what, they can call me. I don’t care if it’s 2 or 3 o’clock in the morning, and I’ll be there,” she said. Hill added that all of the things the brothers once stood for still stand even after the tragedy. Steve Lemley, a YSU graduate and member of the Zeta Gamma chapter of Omega Psi Phi when the incident occurred, often stops over the house to visit Johnson’s family. “We’re here for you,” he said to Hill when visiting the home Thursday evening. “If it wasn’t for you guys, I don’t know where I’d be. I love you so much, Steve. I love all of you guys. You’re my son,” Hill said to Lemley as they embraced. “That’s my baby,” she said. Lemley, 26, remembers Johnson as a brother, friend and peacemaker. Lemley said Johnson was constantly laughing and was full of life. He recalled his favorite memories with Johnson. Lemley graduated in the spring and said he misses his dear friend and appreciates all of the things Johnson did for the community and his family. This year, Lemley and the other brothers struggle to recruit new members and rid their fraternity of its party-throwing reputation. He said the chapter is slowly coming back together. Mother Hill has met a couple of young men and plays a large role in choosing new members. Six brothers reactivated the chapter at YSU in 2009: Joe Parker, Andre Miller, Gerald Gipson, Carl Davison, Lemley and Johnson. Lemley said the brothers used Johnson’s death as a crutch for a while. “But if he were here he would say we still have to keep going, keep pushing. Don’t just stop. Keep persevering through any trial and tribulations,” he said. Yet, tenacity still proves difficult for the brotherhood. YSU’s Omega Psi Phi members plan to continue educational presentations and community work in the hope of reflecting the kind of person Johnson was. As for Johnson’s family, friends and brothers, the reflection is love and thanks. “I love you, man. Thank you for introducing me to the family and thank you for being the man that you’ve become … and quit snoring,” Lemley said.